It’s not a secret that the Americans love competitive eating. Freedom gives us a lot of amazing things to do here in United States, including being able to stuff their mouth with loads of food. 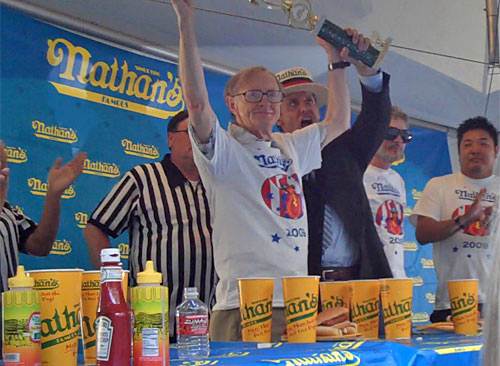 Nathan’s 4th of July International Hot Dog Eating Contest is probably the most famous forum for competitive eating, and fortunately for its participants, it’s an annual event, which means they can always redeem themselves from defeat every year, or at least, get to eat free hot dogs. But that’s just one of the many major eating contests held throughout the country. Even more amazing about these competitions are the people that set some notable, if not crazy records. Take a look at some of the most impressive, if not insane records they have set. This 72-year old badass has been giving competitive eaters a run for their money as he just recently munched and finished 247 jalapeno peppers in as fast as 8 minutes. And that’s not all the accomplishments he has under his belt. He also have successfully finished 6 lbs. of SPAM in 12 minutes, 5 lbs. of cake in 11 minutes, and 8 lbs. of Huevo Rancheros in just 10 minutes. Patrick is a professional competitive eater, and he etched his name in the world of competitive eating by stuffing 47 slices of Big Apple Pizza in just 10 minutes. He also has some insane accolades, likefinishing 72 cupcakes in 6 minutes at Isle Waterloo World Cupcake Eating Championship and 10 lbs. of Blueberry pie for 8 minutes, hands free. This guy has some crazy appetite. This guy probably has the most recognizable face on our list if you’ve been following competitive eating. As a matter of fact, he just won this year’s Nathan’s Hotdog Eating Competition, by finishing 70 hotdogs all with buns in just 10 minutes. The one who came second wasn’t even close, as he only ate 41. 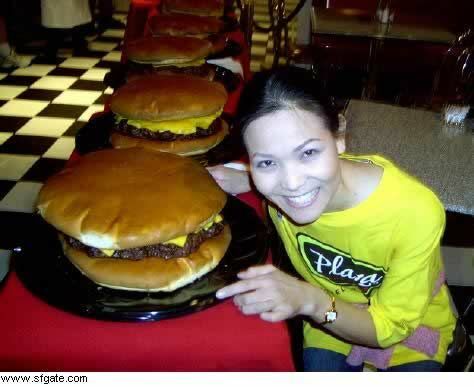 If you think Joey has some crazy appetite, then you may have not heard of Matt Stonie. He’s the only guy to upset Joy in 2014’s Nathan’s Hotdog Eating Competition. What’s crazier is that, this guy only weighs 130 lbs., with a waistline of 28-inches. Where does he stuff all these food? I really don’t know. For his world record, he finished 182 strips of Smithfield bacon all in 5 minutes. If you see this woman on the streets, you would never guess she does competitive eating. Why? Because she only weighs 105 lbs! But don’t mistake her small and petite frame, as she can definitely eat more than you. Her most impressive feat is when she conquered 9 lbs. of Big Daddy Burger in Las Vegas for just 27 minutes. But she’s not just for savory, as she has some sweet tooth too. She showed it by munching on 11 lbs. of cheesecake in 9 minutes.